Well friends, I got offered a new job back in Europe, it's a very good deal so I'll likely be making my way back across the pond by the end of this year! If that's the case, I spent 5 amazing years in the US and I'll always have this country in my heart (and an American firstborn)! 1) market is at all time high, I could sell everything by the end of this year, pay 15% capital gains, take the cash to the new country and then evaluate if I buy a house or invest in ETFs/Funds. Taxes in the new country are 2x the US, so investing in dividends is likely not the best decision, as I would be paying almost 30% on dividends (also on capital gains) plus the complexities around tax withholdings, etc. 3) Find a way to keep it all under US taxation law somehow... this would be ideal, I'm just not sure if there's a legal way to do it. In any case, I would have to leave Merril Edge as they don't deal with non residents, so I'm looking for a new broker which accepts international clients, always a bit of a stressful situation. - Ideally, I'd like to keep a bank account in the US in usd, a credit card associated with it and eventually a brokerage account all linked, do you know of such an option for non residents? Or will I always need a physical address in the US for that? - What broker do you recommend based on low fees, to move my positions from ME to? - What is the best way and with the lowest fees to transfer a large amount of money from usd to Euros in case I decided to sell? I remember I paid an insane amount on fees when I moved from Europe to the US a few years ago. As anyone gone through this process which can share their learnings? PS: 401k will stay where it is, I believe it's the best for now. I've recently been getting e-mails from IB about a new debit card that can be tied to your IB brokerage account. I don't know much about it, but it could be a solution for your bank+brokerage+credit card question. 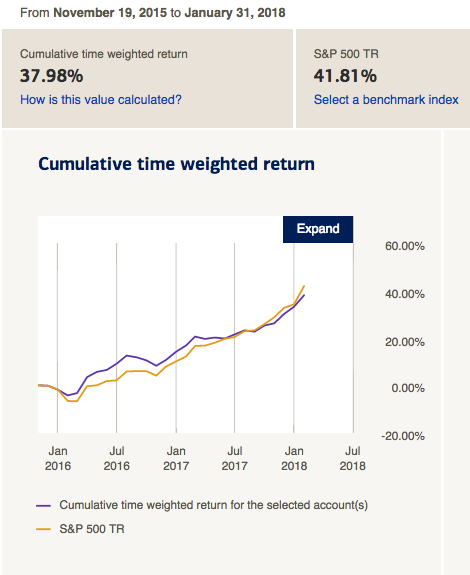 I've been using IB for several years now and am quite happy with it after switching from a more traditional brokerage. The fees are low provided you have 100k of assests. The only downside is that there is essentially no DRIP program. I'm also a US resident, so I can't speak for the non-US resident experience. I'm getting more inclined to sell everything and move the money over. For a while I was excited I could beat the market but... next time around I'll just go with ETFs (saving on taxes and ... well, the market may as well just beat me). In any case, the amount of wealth (dividends + growth) generated in such a short period of time has been staggering! It was better than all my expectations at the start of the process! (02-16-2018, 02:47 PM)Rasec Wrote: For a while I was excited I could beat the market but... next time around I'll just go with ETFs (saving on taxes and ... well, the market may as well just beat me). Rasec, you indeed did well but I am a little confused . . . Were you disheartened that you didn't beat the market the entire time you were invested? Hardly a realistic expectation. If anyone could do that, it would be a first. Buffet & Lynch certainly couldn't do it and neither could Graham or Fisher. I think you need to measure over a much longer period -- 5 years minimum. It's a combination of dividends and generally lower draw downs which contribute to overperformance over the long-term. Not sure how you save taxes by using ETFs over using individual stocks. Perhaps you can expound on that. Good luck in your new adventures. To clarify, I wasn't disheartened that I didn't beat the market, I was disheartened because I was feeling emotionally attached to my portfolio and collecting Dividends at the end of each month! It was painful to sell! But I trust it was the best decision. Re Taxes on individual stocks vs **some** ETFs/Funds, is that for non residents/non citizens you have to pay taxes twice, to the US government and to the country where you have fiscal residence (in this case Portugal). Example, imagine you were to collect $100 in dividends from JnJ, as a citizen/resident alien living in the US you'd take the $100 and pay 15% in taxes, taking home $85 to reinvest or take your spouse/partner out for dinner. Some Funds/ETFs instead of paying out dividends, reinvest in the fund before releasing, hence saving you from the taxes on dividends. You only pay taxes on the sale; capital gains, which are also higher but in this case, the US wouldn't touch it (it's 28% in capital gains to Portugal). You'd have to substantially beat the tracker in order to be worthy continuing to invest in individual stocks the way I was. Good luck with everything Rasec!! My sisters BF just renewed his passport for a Portugal visit. Going to miss your DGI investing posts! Its hard to expect to beat the market year in, year out. Its why things like ETFs make sense for majority of the investors. The only way to do that would be to bet in a non-consensual manner and get it right each time -- probability of which diminishes. Quote: “The problem is that extraordinary performance comes only from correct nonconsensual forecasts, but nonconsensual forecasts are hard to make, hard to make correctly and hard to act on,” writes Marks. You can’t do the same things that other people are doing and expect to outperform. When you do what everyone else does you're going to get the same results everyone else gets. It's not enough to be different — you also need to be correct. The goal is not blind divergence but rather a way of thinking that sets you apart from others. A way of thinking that gives you an advantage. Good luck with the new chapter in your life Rasec. He's already sold everything, but I don't know why he just didn't let his holdings ride. DG is, IMO, a long term investment strategy and by being away should not trigger a sell. If they were good stocks than just let them grow on their own and likely he would not be disappointed when he returns. Current time: 04-21-2019, 05:52 PM Powered By MyBB, © 2002-2019 MyBB Group.